Snow Leopard would be the new State Animal, Western Tragopan (Jujurana) (Tragopan melanocephalus) to be State Bird and Pink Rhododendron (Rhododendron campanulatum) to be the State Flower of Himachal Pradesh. Decisions to designate these were taken in the 3rd State Wild Life Board Meeting held here under the Chairmanship of Shri Virbhadra Singh, Chief Minister, today. Chief Minister said that Snow Leopard, popularly known as the Mountain Monarch has been categorized as endangered by the International Union for Conservation of Nature (IUCN) while the earlier State Animal, Musk Deer was not amongst the endangered species, Monal, the present State Bird is also the State Bird of Uttrakhand and National Bird of Nepal while the Western Tragopan locally known as the ‘King of the Birds’ is included in the Schedule I of the Wildlife Protection Act offering fullest legal protection and Himachal Pradesh happens to be the stronghold of the species and probably harbours the only viable population of Jujurana in the wild in the entire world. 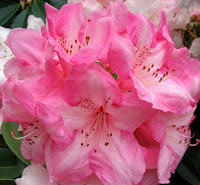 Similarly the present Rhododendrum arboretum, the State Flower was common species widely distributed in entire Western and Central Himalayas, while the new State Flower, Rhododendron Campanulatum, the Pink Rhododendron falls in the threatened species of the IUCN. Shri Virbhadra Singh emphasized the need to increase the efforts manifold to respond to the challenges being posed by the unpredictable climatic changes and external influences responsible for degradation of the natural ecosystems. He said that the State Gross Natural Product was actually going up resulting into enhanced spending. He directed that the estimates of state level populations of monkeys, leopards, wild boar, all of which were widely spread, needed to be revisited and better baseline date generated for policy making and other requirements. He said that if needed services of the experts to carry census be requisitioned besides associating the local communities. He said that rural schools and children living close to the wild life sanctuaries also needed to be associated besides celebrating the Wild Life Week, Wetlands Day, World Environment Day and allied events in a most befitting manner to draw the attention of the people towards wild life activities. 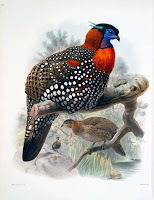 He added that the progress in human wildlife conflict management and conservation breeding of pheasants had been significant in the past one year and needed to be strengthened further to consolidate position as a world leader in conservation breeding of the Western Tragopan or Jujurana. Chief Minister said that the connotation and ambit of the Honorary Wildlife Wardens needed to be enlarged for the better wild life conservation. He said that six wild life sanctuaries Kugti and Tundah in Bharmour, Saichu Tuan Nallah in Pangi, Shimla Water Catchment in Shimla (Urban); Gobindsagar in Bilaspur and Dhauladhar in Palampur which were under the control of territorial forest divisions would be transferred to the State Board of Wild Life for proper management. He said that the State Wild Life Wing would be the nodal agency for the five wetland and wildlife sanctuaries which included Renuka, Khanniar and Candertal wetlands and Gobind Sagar and Pongdam lake, wild life sanctuaries. He said that the rationalization of the protected areas was required. He said that the Chail town and 84 other villages had been proposed to be taken out of the Chail Wildlife Sanctuary, 8.9 sq. kms. of reserved forest area having no rights to be included into the Simbalbara sanctuary besides 14.65 sq. kms of conservartion reserve from forest adjacent to the sanctuary. He said that concerted efforts were underway to get the entire Gobind Sagar sanctuary denotified. The Board approved conserving Sacred Groves as Community Conservation Reserves for better management by upholding the religious sentiments of the local people. It also approved khaki trouser and green shirt as uniform of the Wild Life wing.